Children who take antibiotics have repeat infections, often causing a prolonged merry-go-round cycle. 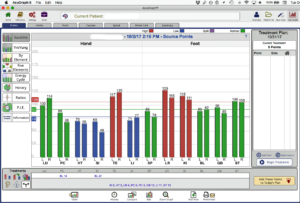 (I had one patient, age 5, who came in on his 60th round of antibiotics.) Part of the problem is that bacteria that cause ear infections become drug resistant very quickly, and tend to easily reoccur. Besides creating drug resistant bacteria, a significant problem in its own right, antibiotics themselves directly injure the immune system. First, while intending to target pathogenic bacteria, antibiotics also wipe out beneficial intestinal bacteria. The beneficial bacteria (over 500 species) are used by the body to acidify vitamins and nutrients so that they can be absorbed through the intestinal lining. Long-term reduction leads to malnutrition, which weakens the body. More consequently, the ability of beneficial bacteria to digest metabolic toxins and pathogenic bacteria and viruses is removed. The immune system on the lining of the intestinal wall must now compensate to neutralize these toxic chemicals and pathogens, significantly taxing the systemic immune response. Second, antibiotics have an alkalinizing effect on the small and large intestines. This is partially due to the alkaline nature of antibiotics, and partially due to the destruction of acid-producing friendly bacteria (acidophilus, for example, produces lactic acid). When the intestines become more alkaline, it fosters the growth of Candida albicans and other fungi. These fungi are directly destructive to the lining of the small intestines because they secrete irritating aldehydes, which perforate and deteriorate epithelia cells lining the intestinal wall. This causes Leaky Gut Syndrome, a cascade that starts with reabsorption of toxins meant for excretion and result in a wide variety of symptoms and presentations, including chronic fatigue, fibromyalgia, headache, eczema, etc. I have come to the conclusion that because antibiotics have serious consequences on one’s health, they should be used only for serious hospital-level infections that threaten the bone, blood, or deep organs such as the heart or kidney. In these cases, antibiotics should be given intravenously, which ironically do not cause much disruption to the intestinal flora. Studies show that there is no difference in recovery between children who take antibiotics and those who do not, except that the ones who do have an increase of a repeat infection within 6 weeks. Yet, ear infections, or suspected ear infections, are the most common reason a child is given antibiotics by a western medicine physician. I believe that the frequent administration of antibiotics to children is the single most important event diminishing a child’s immune system and health. The use of Chinese herbal products offers the most effective alternative for common pediatric infections. Actual events of ear infections in children who do not take antibiotics is quite rare, perhaps one of two events within 10 years. Within the context of Chinese medicine, the problem is caused by a wind-cold attack to sensitive acupuncture points on the neck, around the ear and the head. The skin contracts, leading to stagnation of qi and blood around the ear (internal and external), with a concurrent diminishing of the wei qi. As wei qi is diminished, pathogenic heat toxins (virus/bacteria) accumulate, producing heat and phlegm. The accumulation of fluids is the cause of pain, with heat causing the ear canal to be red. The problem is compounded for infants, because the ear canal is not anatomically shaped to allow good drainage until about the second year of life. Other factors cause the ear canal to appear red, incidentally. Any fever or even over-excitement in an infant will do this. This does not mean there is an ear infection, although mediocre pediatricians will often prescribe antibiotics for a red ear canal alone. Ear infections are more obvious when the ear drum bulges, which mean that fluids are accumulating. These children often come in for cold or fever, but are given antibiotics because the ear is red or bulging. Many of these events, however, will correct themselves without intervention, or with herbal treatment for common cold. My diagnosis for ear infection is based on pain, the fact that a child holds his ear or won’t let you manipulate his outer ear. Although competent with an otoscope, I rarely push this sharp object into the ear of a child with an obvious ear infection. Rather, I will give him the appropriate medicine. If the ear is not painful, I am more likely to treat it as a viral cold with formulas such as Gan Mao Ling, Zhong Gan Ling or Yin Qiao San. In my clinical practice, which has always included a large number of pediatric cases, I have had to develop an herbal formula successful for ear infections, one that parents could keep on hand for those sudden, middle-of-the-night explosions of pain and panic. At first, I powdered and combined three herbal patent medicines into one formula. Eventually, I ended up by taking key herbs from these three formulas so as to keep the formula below 13 herbs. The three formulas I initially used were the following. I choseYin Qiao San (Wu Jutang, 1798) to dispel wind-heat, clear heat and resolve toxin. Although I mentioned that ear infections are initiated by an attack of wind-cold, once the pathogenic wind is trapped in the interior, heat toxins accumulate, and cold quickly turns to heat. I then chose Xiao Chai Hu Tang (Zhang Zhongjing, 220), which, due to its ability to go to the “half-interior/half-exterior” shaoyang area, would direct the formula to the middle and inner ear. The shaoyang area targets both Gallbladder and Sanjiao channels that encircle the middle and inner ear, as well as the lymphatic layer in general. Finally, I added the formula Bi Min Gan Wan (Pe Men Kan Wan) to direct the formula to the nasal and eustachian tube area, and to dispel wind, clear heat, and transform phlegm. This combined approach proved very successful for acute painful ear infection. When I decided to create a single formula, I was more inspired by the therapeutic principles I was trying to achieve rather than the particular herbs used in the original 3 formulas. Towards this end, I first chose herbs to dispel wind, and ended up using both heat and cold clearing herbs. These are Bupleurum Chai Hu, Chrysanthemum Ju Hua, Angelica Bai Zhi, and Zingiberis Sheng Jiang. I then chose herbs to transform phlegm to make it more watery, and herbs to drain this damp downwards out of the body. I used Fritillaria Zhe Bei Mu, Pinellia Ban Xia, Peucedanum Qian Hu, Agastache Huo Xia and Poria Fu Ling. It also includes Vitex Man Jing Zi, an herb which drains damp and dispels wind, and which conveniently leads the formula to the mid and inner ear and sinus. Next, I choose two herbs to clear heat and resolve toxins, Forsythia Lian Qiao and Coptis Huang Lian. The former is effective against upper respiratory virus, and the latter against bacteria. Finally, I added Paeonia Chi Shao to circulate blood to relieve pain. If we look at percentages used for the ingredients, one can get a sense of my orientation. My biggest concern was the need to transform and remove accumulated phlegm, which is the real cause of ear pain. For this reason, 49% of the formula uses herbs to transform phlegm and drain damp. An herb particularly useful here is Agastache (Pogostemon) Huo Xiang, which drains turbid damp. I believe it also has anti-microbial properties. Classically it is found in formulas for turbid damp in the stomach causing diarrhea such as Huo Xiang Zheng Qi Tang (Chen Shiwen, 1080). I noticed in compiling my textbook on patent medicines that many modern formulas for sinus congestion utilized Huo Xiang. This formula is intended for acute ear infection. I know through my own experience, and those of many practitioners who have used this formula, that it can control the pain with one dose, within 2 hours. Basically, the formula is available from Golden Flower as CHILDREN’S EAR FORMULA. It comes as a powder (prepared by KPC in Taiwan), and is easily dissolvable in hot water. Each bottle is meant to be used for a single event. Add the powder to a bowl, and add a little boiling water, enough to make it thick but not too thick. (Or use the empty bottle: fill with boiling water, and add that to the bowl of powder). Stir well. It is best to have a pediatric syringe, calculated in ml (or cc, which is the same). Give 1 ml of herb plus 1 ml for each year of the child. An infant would get 1 ml; a one year old would get 2 ml, etc, up to 5 or 6 ml as a maximum dose. If you don’t have a pediatric syringe, use the eyedropper enclosed with the bottle. One eyedropper squeeze (about half the dropper) equals 1ml. Give a dose every 2 hours until pain is relieved. It will also reduce accompanying fever. Usually, the child will need one to three doses to control the event. (In some cases, the pain may last several days. In this case, give one dose every 3 or 4 hours.) Throw out the bottle once one episode is over. If giving to an infant or toddler, have them lie flat on their back. Squirt a little into the back of the throat several times, allowing them to swallow. They may make a bad face, but they recover immediately after swallowing. Follow with nursing or a little sweet juice to take the taste away, if necessary. The formula is safe for newborns. In any child, the parent may notice loose stool or diarrhea; this is the process by which the body expels turbid phlegm. If the patient’s case is complicated by cough or high fever, you will need to use other formulas in conjunction. 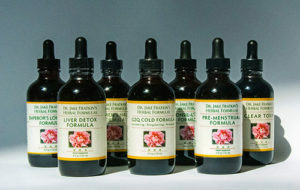 Golden Flower’s CHILDREN’S EAR FORMULA is also available in bulk 100 gram bottles. This is convenient for practitioners with a busy family or pediatric practice. Use one-ounce bottles, and fill the bottle about one-third with herbal powder. All parents of young children (newborn to age 3) should keep a bottle of CHILDREN’S EAR FORMULA on hand for an emergency. It’s an amazing product due to its speed in efficacy. Best of all, one avoids an unnecessary dose of antibiotics, which can injure a child’s immune system. Because ear infection is one of the main reason antibiotics are given to children, this one product could seriously reduce unnecessary antibiotic use in this country. This formula can also be used for adult ear infection with the same presentation. We are speaking of otitis media, or middle ear infection. Otitis externa, or swimmer’s ear, can benefit from this formula, but it is also necessary to use a topical application such as oil-cooked garlic or the patent medicine ERYAN LING OIL (product 2B3-1 in my book), which is a topical oil-based version of Huang Lian Jie Du Pian. “A recent study of 456 children with ear infections found that 41% were caused by viruses. ”Heikkinen T, et al. (1999). Prevalence of Various Respiratory Viruses In The Middle Ear During Acute Otitis Media. The New England Journal of Medicine, 1999; 340:260-264, 312-313. • More than 5 million cases of acute ear infections occur annually, costing about $3 billion. • Nearly two-thirds of children with uncomplicated ear infections recover from pain and fever within 24 hours of diagnosis without antibiotic treatment. • 88% recover within 1 to 7 days, without antibiotics. (27) Van Buchen FL, Dunk JH, and van Hof MA: Therapy of acute otitis media: Myringotomy, antibiotics, or neither? Lancet 2:883-7, 1981. Original article: Diamant M and Diamant B: Abuse and timing of use of antibiotics in acute otitis media. Arch Otol 100:226-32, 1974.